I agreed to read and review this book for TLC Book Tours; it’s not a book I probably would have picked up otherwise, but it’s good to have my horizons expanded a bit once in a while. There is a young woman, very young, in fact just twenty-one, seated on the edge of a paisley-draped foam couch in the living room. She crosses and uncrosses her long legs under the midcalf, serviceable gray wool skirt, far too heavy for such a warm night. Made by a local dressmaker and bought at a Bennington College sale for $12, the skirt is so serviceable that for forty-five years it will hang in her closet, rarely if ever worn. Besides the moths, maybe it is her memories it will serve. She looks down, appraising her sandals, new, from Fred Segal on MacDougal Street, with leather thongs that lace up past her ankles. Too tight, they will leave grooves that will take years to erase, but tonight her only concern is that her exposed feet might look too big, which they are. She smokes a Pall Mall and then another, and holds a glass with a few inches of gin and a dollop of tonic, as if it were her ticket to where the high life might be. Something about this opening scene brings to mind a curtain rising and revealing a stage set, and the reader is invited to sit back and watch the show. And no wonder it has this feeling – Van Horne becomes a successful playwright many years after this fateful night in 1955 when a much older man sits down beside her on that paisley couch and enters her life. Eventually this unlikely pair get married – after Clem’s contingency “as long as everything stays the same,” and his offhand reference to an “open marriage,” which Jenny barely bats an eye at because she can’t fathom that he’s serious. Over the course of their nearly forty-year relationship, Jenny is thrust into the art world where she regularly rubs elbows with many important and influential people, travels the world, and yes, engages in an open marriage. About half of the book takes place in the 1950s, with the second half covering the ’60s, ’70s, ’80s, and ’90’s. There were large chunks of the story that kept me engaged, and large chunks – mainly the chapters devoted to describing Clem’s and her relationships with people in the art world (people I’ve never heard of), that bored me and I found myself skimming those portions. Although the book’s subtitle is “My Life With Clement Greenberg,” it’s really only partly about Van Horne’s life with Greenberg; it’s largely a story of self-reflection and discovery. Jenny is a hard nut to crack – in the end, I never did figure out if she was happy with her life or not. I think the title is a little misleading. 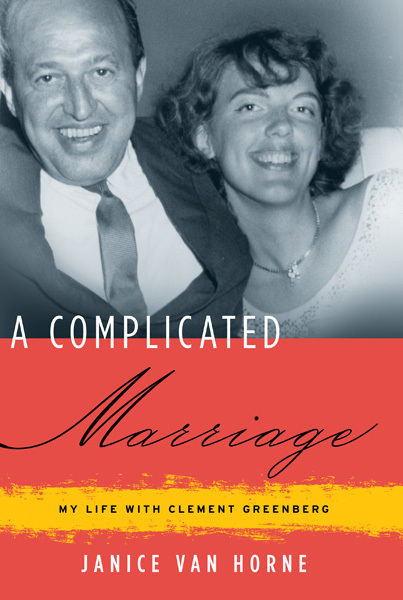 It seems as though their agreement to have an open marriage was, in fact, to keep things from becoming too complicated – and I never got the sense that their relationship was “complicated.” I think “interesting” would be a more apt description. It’s hard to relate to the idea of an open marriage, but, hey, it seemed to work for them – although it’s hard to imagine their daughter wasn’t deprived of some sense of stability. In any case, it’s a good book, although it is probably more to the liking of: (a) people interested in and knowledgeable about the art world, and (b) people intimately familiar with that bygone era of 1950s New York. TLC Book Tours has set aside a copy of this book for me to give away to a lucky winner! If you’re interested, leave a comment saying so, and I’ll choose a random winner on Monday, May 20. ← Mother’s Day Daily Book Giveaway! Hmmm … Sounds interesting. I don’t know anything about the art world. This book would be fascinating and memorable. thanks for this giveaway. I’d love to discuss with a book club your point about the title and how having an open marriage kept things simpler or more complicated. That’s a really interesting thought that I think would generate a lot of discussion!